Gill et al. 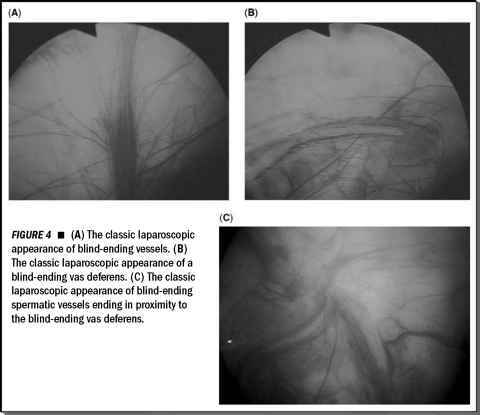 described a method using two needlescopic ports inserted suprapubically into the bladder (Fig. 2) (16). The bladder is distended with irrigation. Under cysto-scopic visualization, two 5-mm balloon tipped ports are inserted suprapubically into the bladder one fingerbreadth superior to the pubic bone on either side of the midline. A 5-mm Endoloop® a is inserted through the port on the same side as the affected ureter, and the loop is positioned around the ureteral orifice. A 6 French ureteral catheter is then passed retrograde over a glide wire into the targeted renal pelvis. The bladder cuff is resected transurethrally with electrocautery using a Collins knife. The ureteral orifice is tented by a grasper from one of the ports, and an Endoloop is used to cinch down and occlude the ureter via the second port. The distal ureter with its bladder cuff is dissected with the Collins knife, using anterior retraction with a grasper. The bladder cuff is circumferentially detached in a full thickness manner, en bloc with the intramural ureter. Continuous wall suction to both suprapubic ports are used to minimize extraperitoneal irrigant absorption. Once completed, the patient is repositioned, the remaining nephrectomy is then performed laparoscopically via a retroperitoneoscopic approach. In a series of 42 patients from the Cleveland Clinic with a mean follow-up of 11.1 months, there was a 23% recurrence rate in the bladder and none in the retroperitoneum (17). One patient experienced extraperitoneal fluid extravasation, which resolved with conservative drainage. The advantage of this technique compared to the pluck procedure is that urine extravasation from the affected kidney is minimized by obstructing the ureter with an endoloop, thus decreasing the risk for tumor seeding. 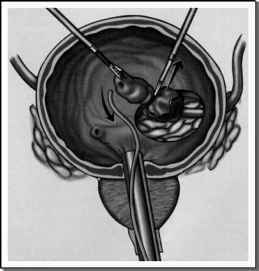 Also, with an anterior retraction using the Endoloop, cystoscopic mobilization of the ureter is performed more extensively, and subsequent plucking of the ureter is facilitated. The disadvantage is that irri-gant extravasation may cause possible hyponatremia during a long procedure. Also, the patient must be repositioned intraoperatively, lengthening the total surgical time. This procedure is technically difficult and requires a vast laparoscopic experience. FIGURE2 ■ Intravesical method demonstrating two needlescopic ports inserted suprapubically into bladder. The Endoloop is cinched down to occlude the ureter, after the bladder cuff is resected with electrocautery.